Play At Home Mom LLC: Homemade sensory board - I think it, Daddy builds it. Homemade sensory board - I think it, Daddy builds it. Having taught children with autism for 11 years, I knew there were great benefits to sensory integration. 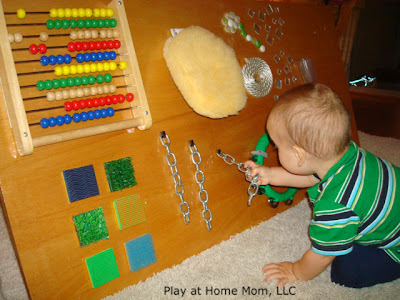 I think when I had my son, I immediately started collecting things to put on a sensory board for him - LOL. I wanted to include light, noise, and tactile items to stimulate the senses. Several items are affixed with Gorilla Glue (super strong) and other larger items are affixed with screws or brackets. 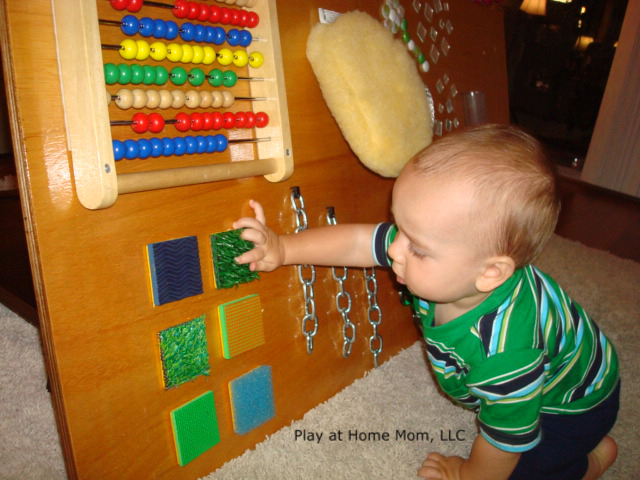 He loved this board and I knew I was helping him learn about his world through his senses. My husband purchased a board from Home Depot - any board will do. 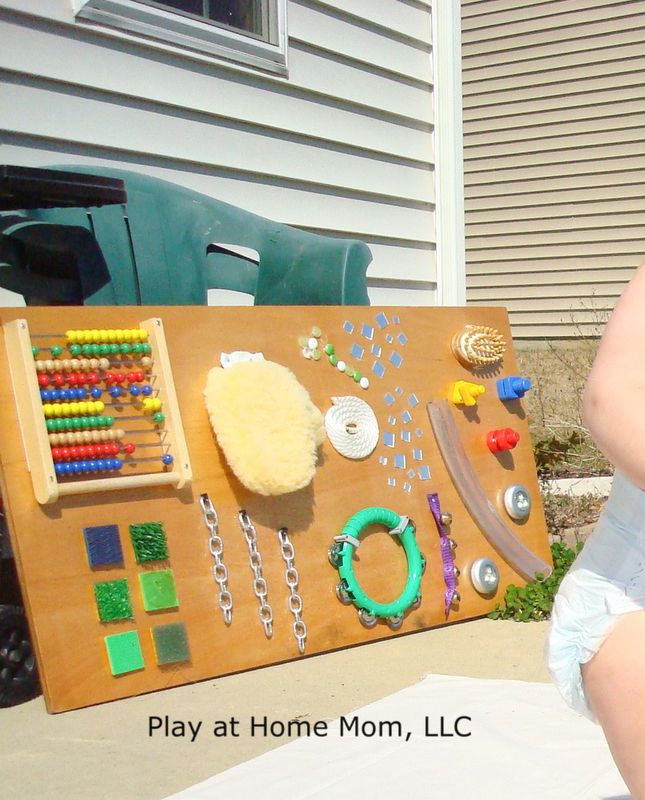 There are so many items you can include on a sensory board - and you can really cater it to the needs/age/interests of your child. My son was only 6 months old when we built his, and I purchased a lot of items from the Dollar Tree, so we kept it pretty simple. Latches, locks, and other fasteners are good options for older children. I just LOVE LOVE this! Very creative and some interesting things on it! I would live to come up with something like this. You might like the sensory boards I made for my classroom. BTW I too worked with autistic and special needs kids and my son is autistic - I think that's why I love your blog so much. Hi! Love the board! So you just prop it up against something! I want to make one for my 8 month old but I'm afraid she will pull it down. Thanks! Yes, we just propped it up against something. I was usually right there when he was playing with it - tracking his play - talking about the textures, lights, etc - so I made sure he didn't pull it down on himself. There were two times where he went over and explored it alone and it tipped over, but it didn't hurt him at all. I love this idea! How did you attach everything? I'm a little nervous my little girl would pull things off? Very cool! Did you use an old table top or just buy a piece of wood? Where did you get the bead toy and texture squares? My son is blind and texture play is very important. I was just at a low vision center for children and they had several homemade texture boards like this. They are so fun for the kids. What type of varnish or coating did you use on the board? hi...love this idea! what are the tactile squares and where did you find them? thanks! Love this idea. Our daughter is 7.5 months old now, and we are finding that she needs more stimulation. So glad I discovered your site. This gave me some help in making my son a portable sensory board for my son (to bring to school). It came out pretty good :) And has a little theme to it as well. @Pearl Magazine, That is not a stupid question, It absolutely is a wonderful thing for any child that needs sensory input. I would say a 12 mo old could certainly benefit as they are sensory seekers at that age no matter if they are autistic, spd, etc, or not. I'm going to be attempting to make on of these soon!! Is there a specific list of item you put on this, or a tutorial? You can put whatever you like on it. 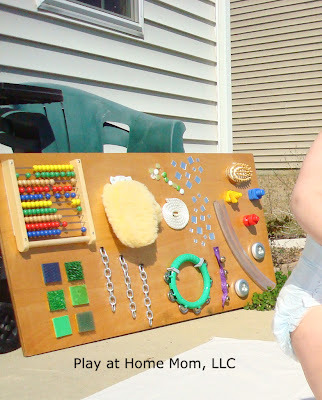 There are more great ideas on our pinterest page under PAHM INSPIRED SENSORY BOARDS. i cant see the pictures on your blog....did you drop the pictures?